The fact that Ivanka Vacuuming has successfully annoyed America’s First Oligarchy is enough to forgive some of this disappointing symbolism. It’s hard to say what is most disorienting about the interactive performance piece, Ivanka Vacuuming, created by artist Jennifer Rubell and presented by CulturalDC — the schadenfreude it instigates, the somewhat anachronistic feminist button-mashing, or the ridiculous notion that Ivanka Trump has ever used a vacuum cleaner in her entire life. 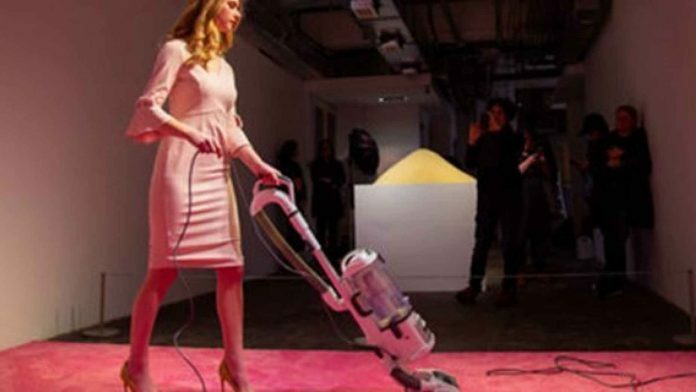 The performance piece, which runs from 6-8 pm daily through February 17 at on view at the Flashpoint Gallery in Washington, DC, features an Ivanka Trump lookalike outfitted in a pink dress and stiletto heels, vacuuming a pink carpet with a pink vacuum. Nearby, a mountain of crumbs is displayed on a pedestal, and visitors are invited to throw them onto the carpet of the installation for the Ivanka to clean up. Symbols are fun, aren’t they?! Well, not for everyone. Trump responded to the work today with predictable iciness, framing the work as woman-on-woman violence. “Women can choose to knock each other down or build each other up. I choose the latter,” tweeted Trump, alongside a link to a story on the exhibit. Presumably, this does not include the women who suffer through verbal abuse and poverty pay in her garment factories, as reported by The Guardian in 2017. If either Ivanka Trump or her brothers, who also tweeted in her defense on the topic, cared to level some real criticism, it might be about the banality of some of Rubell’s choices here (PINK = WOMEN, GET IT? VACUUMING, GET IT?? ), but the fact that it has successfully annoyed America’s First Oligarchy is enough to forgive some of this tired symbolism. But that is, in fact, Rubell’s real point. That’s the trouble with turning women into symbols — it’s all fun and games until someone loses their reproductive rights, fair wages, and status as equal citizens (though to risk losing them implies that women ever had them to begin with). The fact that vacuuming is read by the installation’s maker and detractors as a belittling activity shows the really disturbing common ground between them: the notion that the work women are expected to do is highly problematic. Maybe Ivanka is bothered by the sexism, or maybe she’s merely annoyed that any semblance of her doing domestic labor tarnishes her image. It is interesting to consider what kind of read the installation would get without invoking the incredibly loaded visage of Ivanka Trump. An artwork that merely sought to highlight the pleasure we collectively take in forcing women to perform the bulk of our domestic and emotional labor wouldn’t receive any attention at all if it didn’t offer frustrated liberals the opportunity to take out some “harmless” aggression on a symbol of their discontent. I mean, where’s the fun in that?